Even if you don’t have a logo, your business still has a brand. Branding is about the impression you make, what is special about your business and how you connect with your target audience. It encompasses your company name, what customers say about your business when asked and what it is like to do business with you. However, few small businesses really understand what brand identity is and why it is important to their overall marketing strategy. 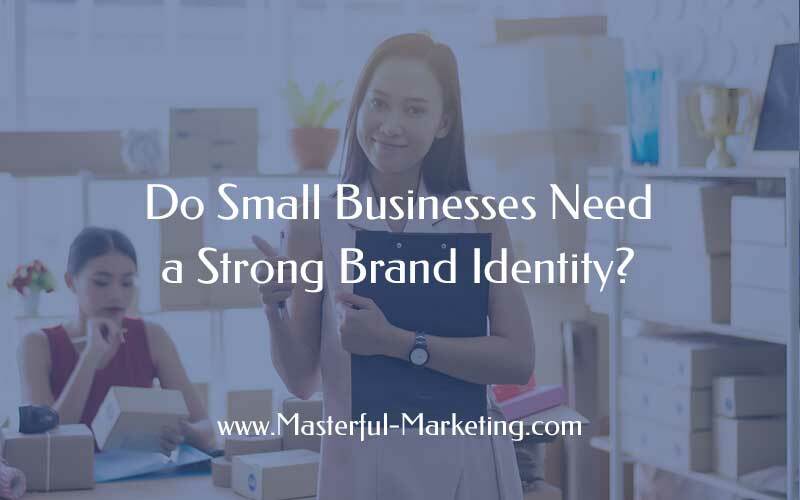 There are many benefits of a strong brand identity and small businesses should take advantage of building one that creates visibility and trust, especially when trying to attract new customers via online marketing activities. Is everything you are, the value you deliver and the total client experience. Every image you project needs to consistently reflect the personality of your business. Reflects your business’s promise, message and values. Your identity should be consistent with, and reinforce, your purpose and your core message to your customers. Conveys the expectations and promises that you extend to your clients in terms of quality, service, reliability and trustworthiness, shaping their perception of you and your business. Helps the audience differentiate you from your competitors, positively influencing their decision to hire you. A good brand communicates clearly, artistically and creates credibility. It enables you to provide customers with an image that can evoke feelings about your business, having a powerful impact on whether someone wants to do business with you. When someone looks at your business card, website or marketing piece, what does your image project? Does this image reflect your business’s personality and values? Is it consistent across every aspect of your company – from your materials, to your attitudes, to the way you answer the phone, to the way you conduct yourself in public? How do you determine your brand identity? If you have never thought about your brand and just let it happen, it would be beneficial to take some time to determine what your brand projects and whether it is consistent with your values. Ask customers the first words or images that come to their mind when your business is mentioned. If they consistently respond with adjectives that fit your business such as reliable, committed to excellence or delivers quality on time and within budget, then your brand has been developed and you can now take it to the next level. When responses are inconsistent, ambiguous, or refer to attributes such as cost, it is an indicator of a weak brand image. If you have a weak brand, determine what it should be and focus on marketing efforts that help build awareness around your brand. Remember that your brand is developed through an entire customer experience and needs to be reinforced consistently through your Web site, social media profiles, sales tools, promotional items, customer service, messages and other aspects of doing business with you. If you have developed a good brand, it should continue to evolve with your business. As your business matures, so should your brand. Keeping it fresh helps your business continue to be relevant to your customers. Evolving your brand does not mean changing your brand but rather refreshing, updating, or clarifying the image you use so it aligns with your mission and values as a company. If you have had the same logo for several years, talk with a designer to see if you can update its look without changing the overall image it projects. If your brand is weak, work on strengthening it. Review your web presence and work to build a strong online presence to drive more qualified traffic to your business. Update your social media profiles. Consistency of the brand across all platforms builds credibility and trust. Inconsistent profiles, messages and images leads to confusion and weakens your brand. Obtain social proof. Encourage online reviews from happy customers to help project the quality and value you deliver. No reviews or testimonials raises questions about your ability to deliver. Engage with your target customer through content. Customers are researching solutions long before contacting vendors. Providing highly-informative content will increase the expertise associated with your brand. Small businesses are under the microscope due to all the exposure that can be easily achieved by effective online marketing. Build a strong brand identity by ensuring you always under promise and over deliver. Then you can achieve those positive reviews that can propel your business to enormous success. Developing a strong brand identity for your business is an extremely important factor in its success. Effective branding can help build your reputation, make you stand out from your competition and project your values to attract your ideal client. Interesting article. Thanks for sharing such helpful tips. I found the section about how to evolve your brand very useful. I am so glad to be here today. At present, everyone wants to become a good entrepreneur. But many of the folks are unsuccessful just because of their poor vision on Marketing. They fail in implementing business strategies. And you have given simple but effective marketing tips about brand identity. Great efforts. Thanks for writing this post.